An acoustic release is used for the recovery of valuable underwater equipment. The release will hold onto the anchor of a buoyant instrument until it is commanded to release it. An acoustic release has the ability to both receive and transmit signals to a surface instrument. It uses battery power and is typically designed to last for 1-2 years. Acoustic releases can be used in shallow water or deep water, and for large, heavy loads, or smaller instruments. The releases are especially useful in deep areas where the instrument could not be recovered by diving. 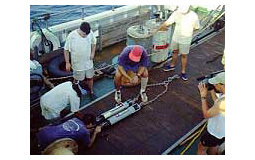 The acoustic release “holds on” to the anchor of a sediment trap to be deployed. The acoustic releases are deployed in tandem to ensure equipment recovery in the event that one release should malfunction. Photo courtesy of Marine Sediment Research Laboratory, Department of Geological Sciences, University of South Carolina. Acoustic release device. Photo courtesy of Marine Sediment Research Laboratory, Department of Geologic al Sciences, University of South Carolina. A shipboard transmitter sends out a short ping at a certain frequency to locate the acoustic release. The release will reply to the transmitter, indicating how far from the ship it is located and that it is still operating. This can help monitor the system and check that the release is still operating. 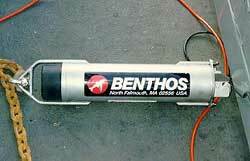 Diagram of the Autonomous Underwater Hydrophone (AUH) mooring. The schematic is not to scale, but does show the main mooring components and their locations in the water column. The acoustic release found at the bottom is used for proper recovery of the instrument. Photo Courtesy of NOAA Ocean Explorer: Submarine Ring of Fire 2003. When the equipment is ready to be recovered, the transmitter will first locate the release, and will then send out a special coded signal, which commands it to release. The acoustic release will let go of the anchor, allowing the instrument(s) to float to the surface and the equipment to be recovered. BENTHOS – Acoustic Release Brochure. Sonardyne – Acoustic Release Transponders. NOAA Ocean Explorer. February 2003, Submarine Ring of Fire. Subsea Sonics – Underwater Acoustic Release System.